If fall fashion is all about military chic, big hair, inky, smokey eyes and thigh high boots then according to designer Jenni Kayne next spring is going to be quite the opposite. Kayne's collection showed off a desert-influenced bronzed California-earthy chic chick that's ready to travel in style and sophistication. The pieces were fresh and unique in gorgeous bright colors, minimalistic designs patterns, and interesting textures such as leather and lace. The Inspiration: "A top-down, music-blaring road trip from the big city to Joshua Tree"
My Favorite Looks: A structured fitted khaki dress with accent buttons and a matching jacket and a magenta on pink skirt/top combo with a stunning Lucite necklace. Makeup: Stila makeup artist, Sarah Lucero created a palette with earthy, neutral colors from Stila’s latest collection debuting this spring. Bronzed eyes, lips and cheeks channeled a “ride down the California coast and conveyed the effortless, wearable luxury of the collection,” says Lucero. The makeup guru used Stila One Step Makeup to create a dewy, clean face. She applied Stila One Step PrimeColor in Bronze Babe to add a sunkissed flush. Lucero then applied Stila Eye Shadow in Puppy over the lids. Stila Coconut Crush Lip & Cheek Stain (launching spring 2011) was also applied and Lucero topped off the look with Stila Prime Pot in Caramel (launching spring 2011). After seeing how gorgeous their skin looked, I can’t wait to try Stila’s One Step Makeup and Stila One Step PrimeColor. 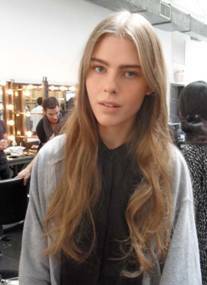 Hair: Redken created long flowy, boho-chic hair with a seventies vibe. The hair was all parted down the middle and blow dried out . The hair had an easy feel that's meant for a woman who can hit the beach, road trip down the coast line or socialize in style. 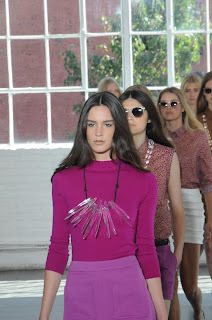 Fall 2010 Trends/MIA For A Minute!